Teaching English abroad is one of the simplest ways twenty-somethings (or anyone for that matter) can travel and live abroad long-term. English teachers are wanted everywhere and by having help with visa assistance and continue the income stream ESL (English as a second language) teachers abroad are able to stay on the road longer. Asia is a major destination for teaching English as most places only require a TEFL (Teaching English as a Foreign Language) certificate and undergrad degree. When I first left home, I went straight to Chiang Mai and completed my month-long certification. From there I almost immediately started full-time work as an English teacher in a secondary school (ages 12 – 16). I’ve also taught smaller groups of children and adults in a language school, privately taught students one-on-one in their homes, worked as a primary school teacher, and had the pleasure of ‘teaching’ 3-4 year olds who liked me much more (and understood me better) than the high schoolers… After teaching ages 3 – 33 in a variety of situations, I know a thing or two about the Thai system and often get questions from readers or travelers about what teaching in Thailand is like and how to go about getting a job. Foreign English teachers are required to have an undergraduate degree and TEFL certificate to legally work. (The only way to legally work in Thailand requires getting a work permit and visa assistance from your employer. Many people, companies and schools sometimes ignore this and the chances of being caught vary, but technically that’s the deal.) You may be able to find odd jobs here or there if you don’t have an undergraduate degree, but then you risk dealing with possible legal consequences. There are a ton of teaching jobs and different types of schools. 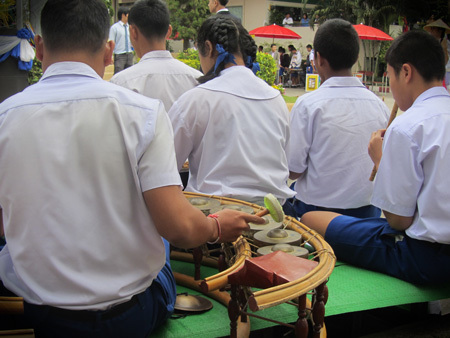 The basic Thai school system is broken up into pre-kindergaten, primary and secondary schools. Within that system you’ll have government (public) schools, private schools, temple schools and international schools. There are also a range of language schools, universities and technical colleges. Additionally, companies and organizations often hire teachers or tutors for their staff and people will look for one-on-one private tutors. Expectations, responsibilities and obligations greatly vary from job to job. At the high school I didn’t have a Thai teaching partner or any curriculum/books to work from and had to create everything on my own for 15 different classes a week (not fun). At the day care/preschool where I sang with 4-year-olds I would just show up ten minutes before the lesson and have any materials I had requested waiting for me and there usually 3-4 helpers in the rooms with about ten kids. Completely different! Ultimately though, often what really matters, as bad as it sounds, is that the schools care about having nice-looking foreign teachers who are native English speakers because it gives a good impression to the outside world. Out of the Asian countries, Thailand tends to pay foreign teachers the least. Unless you’re working at a prestigious international school (which requires an actual teaching degree and often a masters degree), you’re not going to be making the big bucks. You probably won’t have many additional perks either. While some schools offer foreign teachers housing (or housing allowances) and flights home, from my experience, most do not. Don’t teach in Thailand to make or save money. While you’ll make enough to cover your expenses, and maybe even save a little considering the cost of living is so low, chances are you’ll feel like your time and energy is worth more. For example, the high school I worked at paid me about $725 per month, no extra perks or benefits, and I was required to be at the school from 7:45 a.m. – 4:50 p.m. Monday-Friday. I’d say in Chiang Mai, the common wage is 25,000 – 30,000 baht ($833 – 1,000) per month if you’re teaching full time. At language schools you’ll get around 300 baht ($10) per hour. If you’re just getting started on your teaching journey, my biggest suggestion is to take your TEFL course in the area where you think you’ll want to settle down and work. Yes, you can take the course (usually 120-hours/one month) at home or even online, but getting certified in the area where you want to live will give you the opportunity to learn more and get a feel for the area before you start work and help grow your network before you start looking for work. A simple Google search can quickly show what courses are available. Try to learn as much about the course as possible before signing up and talk to someone who works there or who has already taken the course if possible. After you get certified, then the fun of job-hunting begins! Read on for tips on actually getting the job.